In Colombia, the homicide rate is now reported to be 25.9 murders per hundred thousand inhabitants and overall crime rates in many areas are down. This is the lowest rate reported in forty years, yet still one of the highest in the world and is five times the US average. We believe that the greatest underlying factor turning the tide is the spread of the Gospel. The areas that have been saturated with Bibles, Christian literature and radio broadcasts have shown remarkable improvement as local congregations explode. There is still a lot of trouble lurking on our horizon. After the FARC guerrillas went into a unilateral truce almost a year ago a smaller group of guerrillas called the ELN went on the warpath extending their operations. The ELN, founded by a renegade priest, reportedly refuses to enter into peace negotiations unless the Catholic Church brokers the talks. This arrangement has apparently been unacceptable to both the Colombian government and the Church so the extremely violent rampage continues. This has also helped to incite a massive truckers strike and serious unrest on the native reservations. We have begun to refocus our radio broadcasts and Bible distribution into the new hot spots where marvelous opportunities for the Gospel abound. Our workers have had a field day passing out Bibles to the ELN. Two days ago, I sent our last 23 cases of Bibles to Catatumbo, a hot spot on the Venezuela border with a converted former guerrilla. (This is the area where Bruce Olson has conducted his famous ministry with the Motilon Indians.) We were recently able to get through the closed border with 5,000 Bibles. Converted guerrillas distributed them to people and pastors in the troubled Venezuelan state of Bolivar. It appears that no new Bibles have been printed in Venezuela for over ten years. 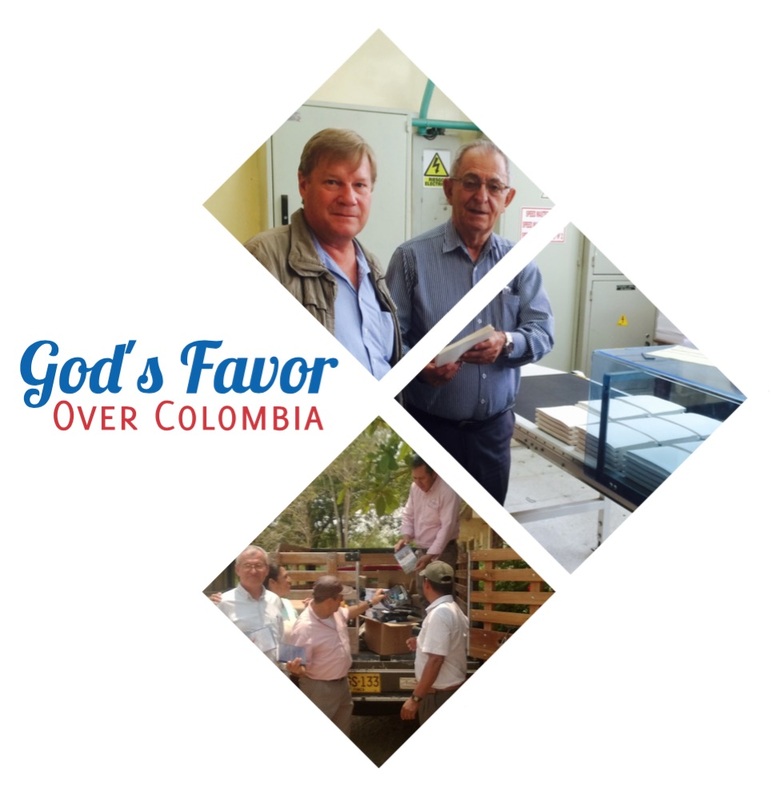 Due to the increased persecution of Christians around the world, VOM – USA has drastically cut back their budget for Colombia and is no longer able to supply us with Bibles or Christian literature. We have decided that Colombia needs a spiritual Marshal Plan to flood the Word of the Lord into all the remaining spiritual darkness. 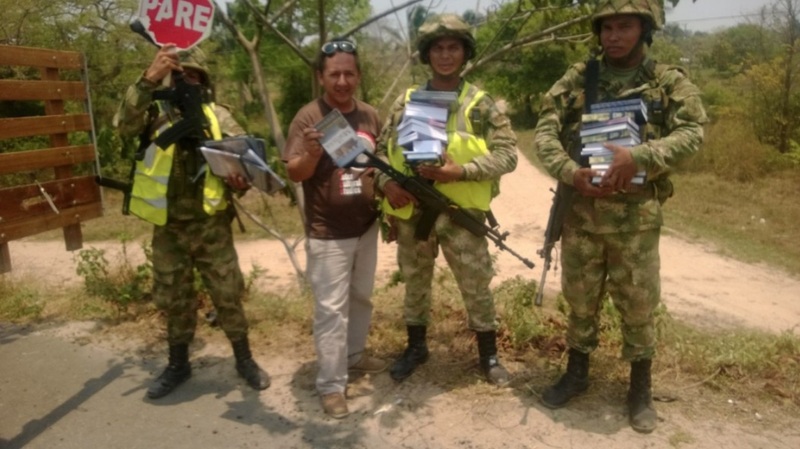 Sources tell us that we are now the only ministry publishing Bibles in Colombia for free distribution to soldiers, guerrillas and paramilitary who are mostly conscripts with almost no personal funds. We are very grateful that over the past seven years God has placed one million Bibles and New Testaments into our hands along with 2.5 million books (mainly through VOM.) Please join us in asking the Lord according to Isaiah 30:26 to continue to provide us with Bibles, literature, radios and resources as He sees fit. … and the light of the sun shall be sevenfold as the light of seven days, in the day that the LORD binds up the breach of his people and heals the stroke of their wound. Yesterday, I went to the print shop in Colombia and told them we were out of Bibles and went on to briefly describe the tremendous need. They told me that if we pay for 10,000 Bibles ($3.78/Bible) they will donate another 10,000. All day long I kept running into people that want to help in one way or another.